Reconciliation Regina is comprised of community leaders, organizations, educators, Elders/Knowledge Keepers, newcomers, survivors, healers, cultural and arts organizations, governments, youth, businesses, service agencies, faith groups and individuals committed to working in partnership to create a strengthened, healthy, vibrant, inclusive community. 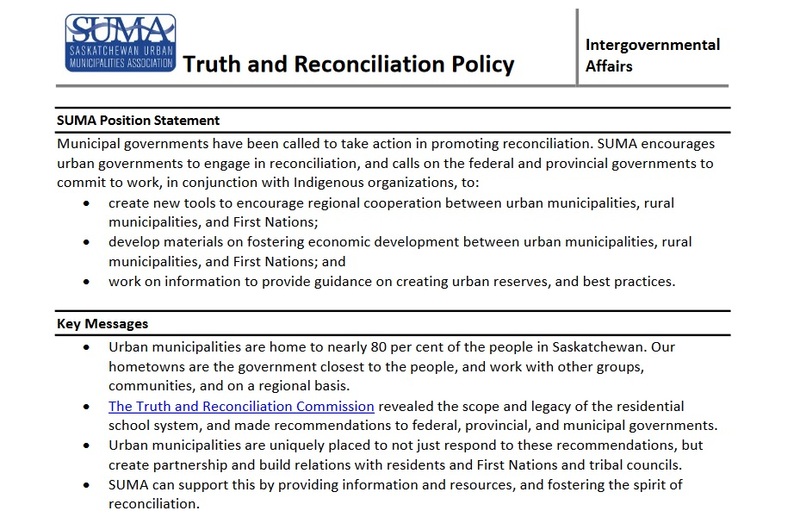 The mission of Reconciliation Regina is to encourage, advocate, support, promote, take action and facilitate truth and reconciliation initiatives at the local level, in collaboration with community stakeholders. Reconciliation Regina began in April 2017 with a meeting of 80 community organizations. Since that time the group has worked together to create a Mission, Values, Vision Statement, Steering Committee, and Subcommittees (Governance, Communications and Community Action Plan Circles). • A public awareness campaign to ensure people in the community understand the meaning of reconciliation, so they will be able to identify their journey in Reconciliation and participate in the healing process. • Assisting the community to move forward with commitments to fulfill the Truth & Reconciliation Commission’s Calls to Action by way of a Community Action Plan. These actions are living, evolving and continuous. Reconciliation Regina forms part of a provincial movement for reconciliation: Reconciliation Saskatchewan. We invite others to participate in Reconciliation activities as a means of learning about reconciliation and expanding the network of people committing to their own Call to Action. See what is happening in your area.